Buddha-Mom Tea : Whispering Sunshine. A Poem? A Tea? Both? 25 gram sample of a sold out brick. $10! Thank gawds I got a taste! This is the first Puerh I have really liked and I have only begun the session. Sadly, the cake is sold out, or I might have been buying my first cake this morning, but there are still samples to be had! Crimson Lotus took the time to write up a pretty lengthy story on the back of this sample and I can see, and read, why. This is a tea you want to know more about. Here are some high-lights of things I learned. Bai Ling Shan or 'White Warbler Mountain' is a remote, high altitude tea. The material in this tea is composed entirely from one ancient tree varietal, and the tea leaf picking is done entirely by hand. The owners chose to call this tea 'Whispering Sunshine' because the tea gardens in Bai Ying Shan are the highest elevation they source tea from. The trees are over a mile high in elevation and they felt they could imagine these teas were close enough to the sun at that altitude to hear it gently whispering to them. 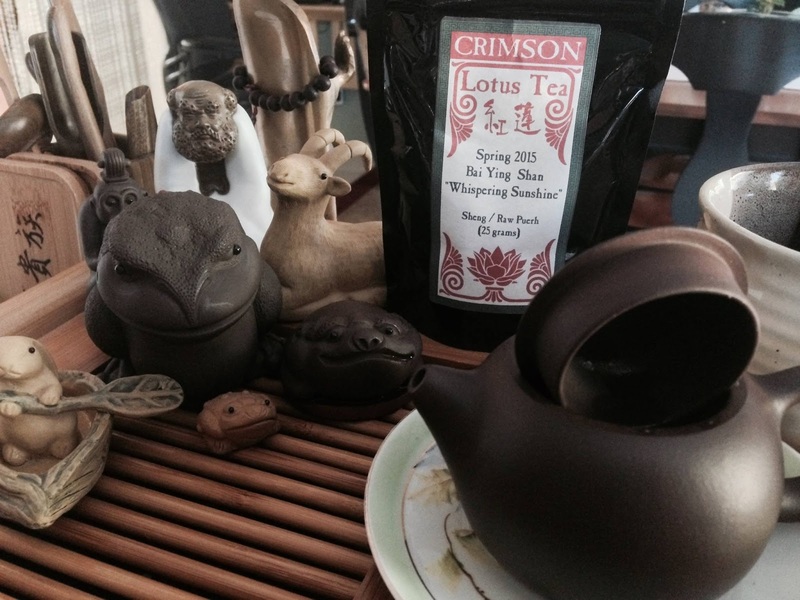 This tea is very light for a Puerh and the main reason, aside from the poetics that I chose to buy it. It is sweet and has a hint of tobacco. This did not put me off. I rinsed once, and sipped three very light infusions. I have now stopped and will let the tea rest a few hours and go back to see what else it has to tell me. Perhaps it will whisper to me some ot the secrets the sun whispered to it, and I shall therefore be slightly more wise than when I began! One can only hope! One needs all the help one can get!